An iconic and endangered population of orca whales living in the Pacific Northwest of the U.S. has sadly lost two more members, bringing its population to a startling 78 individuals. The group, referred to as the Southern Resident Killer Whales, was decimated by the wild capture of its members for marine parks like SeaWorld in the 1970s. Now it's facing even more threats that prevent the population from growing - namely, contamination from pollution like PCBs in the fish they eat, and a dwindling supply of salmon. According to Orca Network, a non-profit dedicated to the conservation of whales in the Pacific Northwest, two whales, dubbed L53 (Lulu) and L100 (Indigo) by researchers, have not been seen with their families in 2014 and are presumed deceased. The whales were 37 years old and 13 years old, respectively. The loss is worrisome, considering that no newborns have been spotted among the members since August 2012. The population is carefully monitored by a decades-long photo identification and survey conducted by the Center for Whale Research. Resident orcas rely mainly on Chinook salmon to survive - the fish make up 70 percent of their diet. One 2012 study found that a dip in salmon numbers, combined with toxins and disturbance from whale watching vessels could amount to a big threat to the population. And while it's not exactly known why they're not breeding, some scientists and conservationists suspect that toxins stored in the whales' fat could harm their reproductive abilities. 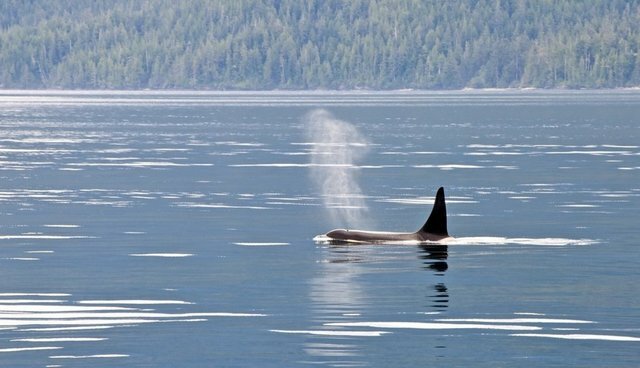 The population is home to the famous 103-year-old orca named "Granny," a whale that makes a compelling argument against keeping orca whales in captivity.